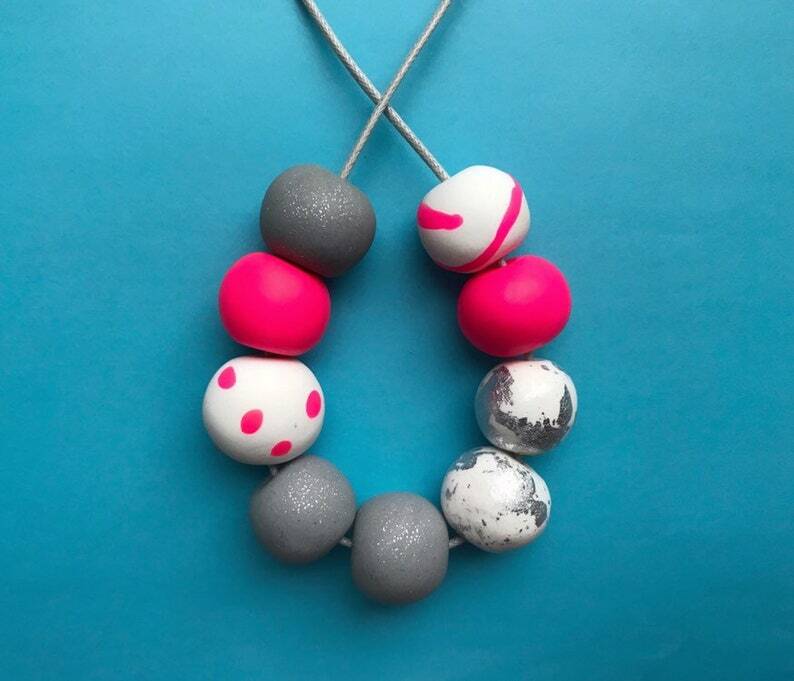 This statement necklace is made from hand-rolled polymer clay beads and strung on grey waxed cotton cord. The necklace is made using sparkly silver, neon pink, white beads with neon detail and white beads with silver leaf. It features a sliding knot design, so it can be adjusted from 42cm (roughly 16.5in) right up to choker fit. The adjustable feature means this stand-out piece will look great with all necklines. The knot is finished with 2 vintage beads. Wholesale sales are available upon request. I offer worldwide shipping, with postage upgrades available. Such beautiful quality and great customer care for a custom order. This item arrived with the other one I had ordered. Once more, I like the necklace very much. I will be giving it to a friend and I am sure she will love it. I will be ordering one for myself soon.